"Plant du Roi" redirects here. For another grape known as Plant Du Roi, see Malbec. "Bathiolin" redirects here. For the French wine grape that shares this and several other synonyms with Dolcetto, see Douce noir. "Chasselas noir" redirects here. For the French wine grape that is also known as Chasselas noir, see Mornen noir. Dolcetto [dolˈtʃetto] is a black Italian wine grape variety widely grown in the Piedmont region of northwest Italy. The Italian word dolcetto means "little sweet one", but it is not certain that the name originally carried any reference to the grape’s sugar levels: it is possible that it derives from the name of the hills where the vine is cultivated. In any case the wines produced are nearly always dry. They can be tannic and fruity with moderate, or decidedly low, levels of acidity and are typically meant to be consumed within a few years after release. One theory suggests the grape originated in France and was brought to Monferrato some time in the 11th century. A competing theory has the grape originating in the Piedmontese village of Dogliani. In 1593, an ordinance of the municipality of Dogliani which forbade the harvesting of dozzetti grapes earlier than Saint Matthew's Day, unless an exceptional authorization had been granted, has been taken to refer to this variety, which is still known in local dialects under the names duzet and duset. A document of 1633 records the presence of Dolcetto in the cellars of the Arboreo family of Valenza. In 1700, Barnabà Centurione sent the wine as a gift to Queen Anne of Great Britain. Along with the French grape Chatus, Dolcetto is a parent variety to several Piedmontese grapes including Valentino nero, Passus and San Martino. Most Dolcetto is found in the Piedmont region of northwest Italy, where many of the top estates produce Dolcetto on less favored sites as an "early to market wine" to generate some income for the winery while the Nebbiolo and Barbera are being matured. It is particularly associated with the towns of Dogliani and Diano d'Alba in the province of Cuneo, although the greatest volumes come from around Alba and Ovada. The grape is also found in Liguria under the name Ormeasco, and in the Oltrepò Pavese where it is called Nebbiolo or Nibièu. Outside of Italy, Dolcetto is known as Douce Noire in Savoie and Charbono in California. However, DNA fingerprinting done at the University of California, Davis has shown that the actual Douce Noire and Charbono vines are not, in fact, Dolcetto, but two different vines. In spite of this confirmation, some plantings of true Dolcetto vines still retain the local synonyms in some areas of Savoie and California. The grape was first brought to California by expatriate Italians, and is most popular in Lodi AVA, Mendocino County, Russian River Valley AVA, Napa Valley AVA, Santa Cruz Mountains AVA, Sta. Rita Hills AVA, and Santa Barbara County. There are also some plantings in the Oregon AVAs of Umpqua Valley AVA and Southern Oregon AVA, as well as the statewide appellations of New Mexico and Pennsylvania. Australia is home to the oldest current plantings of Dolcetto, with vines dating back to the 1860s. Dolcetto di Dogliani, and Dolcetto di Dogliani Superiore are Italian red wines produced in the Langhe using only the Dolcetto grape variety. The wines were recognized as DOC in 1974. In 2005, the original DOC for Dolcetto di Dogliani Superiore was revoked and replaced by a DOCG; this wine, which can also be sold under the name Dogliani, is made within a more limited zone than the DOC and the yield of grapes is restricted to 70 quintals per hectare. Furthermore, to qualify for the DOCG status, the wines must be aged for at least one year. The vineyards are restricted to the hilly areas within the boundaries of the communes of Bastia Mondovì, Belvedere Langhe, Cigliè, Clavesana, Dogliani, Farigliano, Monchiero and Rocca Cigliè, plus parts of the communes of Cissone and Somano. A Dolcetto d'Alba from Piedmont. Dolcetto wines are known for black cherry and licorice with some prune flavors, and a characteristically bitter finish reminiscent of almonds. While the name implies sweetness, the wines are normally dry. The tannic nature of the grape contributes to a characteristic bitter finish. The dark purple skin of Dolcetto grapes have high amounts of anthocyanins, which require only a short maceration time with the skin to produce a dark-colored wine. The amount of skin contact affects the resulting tannin levels in the wine, with most winemakers preferring to limit maceration time to as short as possible. During fermentation, the wine is prone to the wine fault of reduction. Acqui, Barbirono, Bathiolin, Batialin, Beina, Bignola, Bignona, Bignonia, Bignonina, Bourdon Noir, Cassolo, Charbonneau, Charbono, Chasselas Noir, Cote Rouge Merille, Crete de Coq, Debili Rifosk, Dolcedo Rotstieliger, Dolceto, Dolcetta Nera, Dolcetto A Raspe Verde, Dolcetto A Raspo Rosso, Dolcetto Nero, Dolcetto Piemontese, Dolchetto, Dolcino Nero, Dolciut, Dolsin, Dolsin Raro, Dolzin, Dolzino, Dosset, Gros Noir de Montelimar, Gros Plant, Maennlicher Refosco, Mauvais Noir, Montelimar, Monteuse, Montmelian, Mosciolino, Nebbiolo (dialect Nibièu, in the Tortonese and the hills of the Oltrepò Pavese)Nera Dolce, Nibio, Noirin D'Espagne, Nord Du Lot Et Garonne, Ocanette, Orincasca, Ormeasca (at Ormea and Pieve di Teco), Ormeasco (Liguria), Picot Rouge, Plant de Calarin, Plant de Chapareillan, Plant de Moirans, Plant de Montmelian, Plant de Provence, Plant de Savoie, Plant de Turin, Plant du Roi, Premasto, Primaticcio, Primitivo Nero, Promotico, Provençal, Ravanellino, Refork, Refork Debeli, Refork Male, Refosk Debeli, Rotstieliger Dolcedo, Savoyard, Turin, Turino, Uva d'Acqui, Uva d'Acquia, Uva del Monferrato, Uva di Ovada, Uva di Roccagrimalda, and Dolsin Nero. The Dolcetto di Boca, grown in the Novarese, is quite distinct while the rare Piedmontese Dolcetto bianco is an unrelated white grape. ^ a b c d ‘Il Dolcetto’, Associazione italiana sommeliers: Sezione territoriale Trentino. A report of a presentation given by Roberto Perrici in Trento at the Palazzo Roccabruna on 27 February 2007. ^ ‘Dolcetto di Dogliani: Il principe dei vini doglianesi’ Archived February 17, 2010, at the Wayback Machine, Comune di Dogliani, 2004. ^ a b ‘Dolcetto’ Archived February 21, 2010, at the Wayback Machine, Consorzio di tutela Barolo Barbaresco Alba Langhe e Roero. ^ a b c d ‘Vitigno Dolcetto’ Archived December 27, 2008, at the Wayback Machine, Agricoltura in Piemonte: Vini, Regione Piemonte. ^ Ministero delle Politiche Agricole e Forestiale, Disciplinare di Produzione Archived January 24, 2011, at the Wayback Machine. Decree of 6 July 2005, published in the Gazzetta Ufficiale della Repubblica Italiana, of 23 July 2005. 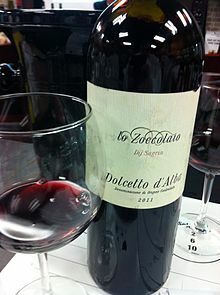 Look up dolcetto in Wiktionary, the free dictionary. "Map of the Dolcetto d'Asti production zone". Regione Piemont. Archived from the original on 2007-06-21. From the official site of the Piedmont region.